As had been speculated, the brief run of the Aston Martin Virage is over with the arrival of the 2013 Aston Martin DB9, shown above. 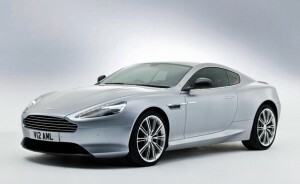 You'll recall that the Virage was introduced as a bridge between the previous DB9 and the now-defunct DBS. Coupled with the arrival of the new range-topping Vanquish, the '13 DB9 eliminates the middle man, so to speak, merging the Virage's styling elements (as evidenced by the DB9's front fascia) with powertrain and chassis tweaks developed for the Vanquish. You will doubtless note that the DB9 looks like nearly every recent Aston Martin preceding it. We'd agree, while allowing that the familial look is a feature, not a bug. As before, it's offered as a coupe or convertible (Volante). Power in the new DB9 comes from the latest version of Aston Martin's 6.0-liter V12, making 510 horsepower and 457 pound-feet of torque in this application. Those are increases of 40 hp and 14 lb-ft over the old DB9, as well as 20 hp and 37 lb-ft over the Virage. Carbon-ceramic brakes are standard, and the car boasts 50/50 distribution of its 3,935-pound curb weight. If you want to shift for yourself, you'll have to make do with the Touchtronic 2's paddles, as there's no traditional manual gearbox offered. Inside, you'll find the same familiar instrument and control layout featured in the current Vantage and the outgoing DB9 and Virage models. A backup camera is now standard. The new DB9 does not receive the updated interior design that premiered in the 2013 Vanquish, so there's now a clear differentiation between the flagship and the "mainstream" V12 car in that respect. If you want to order a new DB9, you may do so immediately. Pricing starts at $185,400 and it hits showrooms in November. For the full rundown, you can view the entire PR blast from Aston Martin below.